However, he argued with the Police and a ministry official that the MPGA and the Jaffna Mothers’ Front had a genuine grievance to which they want to draw attention by peaceful means. 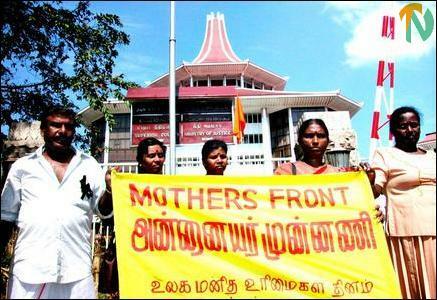 Mr. Satkunam and the President of the Jaffna Mothers’ Front, Mrs. S. Kanakaambikai were later allowed to enter the Ministry premises to submit a memorandum about the missing persons, urging positive action on the part of the Sri Lankan government. Sri Lanka’s Ministry of Justice is in the large court complex in downtown Colombo. The demonstrators carried placards with photos of the missing men and women. “The Sri Lanka army came to our house on Yamuna Road in Nallur, Jaffna late at night on 19 July 1996 and took away my husband, Mr. Kasinathar Balasubramaniam. We have not heard of him since then. 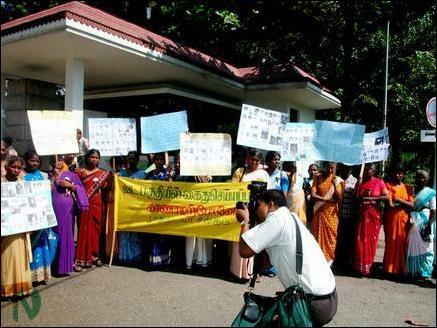 He was 49 when he was arrested by the army”, Mrs. Balasubramaniam, one of the demonstrators told TamilNet, pointing to her husband’s photo on the placard she was carrying. “My son Kannathaasan was going to Chavakachcheri from Jaffna town on business. He had a bag of gold jewellery. 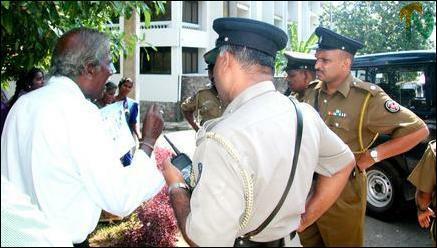 The Sri Lanka military arrested him at Nunavil. He was 21 then. We have been going from pillar to post from the time we heard of his arrest”, said Vadivel Naahamma, 60.